These often-overlooked, but vital, little boxes are capable of more than you think in your electronic projects. Why should serious audio constructors bother with wall warts? To answer that question, you first must ask why manufacturers use them in the first place. The answer, in one word, is insurance. Equipment with a UL label is presumed safe to plug into a wall socket. Conversely, gear without the label is sometimes presumed by insurance companies not to be safe. In extreme cases, if a house catches fire and a piece of non UL equipment is found in the ruins, insurance companies may be reluctant to pay the claims. So why don’t manufacturers have everything approved by UL? Money. Get ting a piece of equipment tested and certified by UL can cost thousands of dollars, especially if they demand design changes. For a small company, that’s prohibitive. In other words, they’re using a wall wart, or its snake-that-swallowed-a- brick cousin, a line lump. Does this matter to you? If you’re building DIY gear for your home stereo it might or might not. Different insurance companies have varying policies (pardon the expression) about UL approval. But if you’re running a home studio, for example, where outside clients come in to perform and pay for your recording services, it’s an issue. If you use DIY equipment in a home-studio context, you should probably get to know and love the wall wart, and learn to use it effectively. In this article I mostly talk about AC wall warts (basically transformers in a box) rather than the more common DC devices, which are problematic for many applications. In the first place, most solid-state circuits these days use bipolar supplies. To power them from a two-terminal wall wart requires the designer to produce some sort of artificial ground halfway between the wart’s + and - voltages, and to keep that ground stable. DC wall warts usually come in a maximum volt age of 24 which means the most you can get from them in a split supply is ± and that’s without benefit of regulation. This could limit headroom. The warts could also power DC-DC converters, but these incorporate switching circuits that can generate all sorts of high-frequency garbage, not something you want floating around inside your chassis. Some DC wall warts, in fact, are switching circuits themselves. Besides, most DC wall warts are mediocre; they lack the good-design touches you’ve come to expect in high-quality gear. Instead of large, high-quality, well- bypassed filter capacitors, they use small, cheap caps with no bypasses. They don’t use fast-switching, low-noise diodes, nor do they incorporate snubber circuits to minimize diode switching noise. Typically they incorporate no spike-filtering protection. AC wall transformers offer surprising flexibility, and can be made to sit up and do tricks, including multiple supplies from a single wart. You can even derive plate voltages for vacuum tube circuits from a low-voltage AC wall wart. Because the user chooses rectifiers and filter components, they can be as good as those in a more conventional circuit. Where can you find chassis jacks? (When I talk about specific parts, I’ll limit myself to devices available in the US, because those are what I know about. Similar parts are made and sold all over the world.) Switchcraft sells the 712A and 722A connectors (for 2.5 x 5.5mm and 2.1 x 5.5mm plugs, respectively). Both have metal sleeves, so they must be insulated from the chassis by 5/16” I.D. shoulder and flat washers. Mouser, Jameco, and Digi-Key all stock these jacks for about $2.40 apiece. How about the warts themselves? Digi-Key has a few, but Jameco Electronics has the mother lode. Jameco’s catalog 273, pp. 197-8, lists 37 different “AC-to AC Wall Adapters,” all but two carrying UL approval. Output voltages range from 9 to 24 with current ratings up to 1.9A. Prices—under $15—are very reasonable. For a simple example, consider a ± regulated supply for use with op amps or similar solid-state circuits. That’s a 30V spread, even ignoring the extra needed for regulators. Will a wall wart provide enough voltage? One possibility which I don’t like is to use a voltage doubler ( Fig. 1). They’re notorious for poor load regulation, and because each leg of the rectifier is basically a half-wave design, ripple is high and equal to the line frequency, rather than 2x the line frequency as found in a full-wave rectifier. This means a given filter capacitor is only half as effective in removing ripple. Instead, I’ll do something more practical for a DIY designer than a commercial manufacturer: I’ll use two identical wall warts. Above: Fig. 1: Wall wart used with voltage doubler. In this and subsequent drawings, resistors hanging on the DC outputs of the supplies represent their loads. Note that the ground is produced at the junction of the two legs of the load, not within the supply itself. Above: Fig. 2: Two Wall warts connected in series to simulate a center-tapped transformer. Above: Fig. 3: Two Wall warts with separate diode bridges. Without going through the math, once I allow for diode, filter, and regulator drops, plus provide some margin for low line voltage, I find that I want 18Vac on each leg of the supply. ( You can just squeeze by with 16Vac but at the cost of poorer filtering and less under voltage margin.) Jameco’s catalog lists model #121216 from ReliaPro, giving at 1000mA. They’re $9.85 each, or $19.70 for a bipolar supply. How to hook them up? One possibility is shown in Fig. 2: the two transformers’ secondaries are wired in series to form a center-tapped 36 transformer. With wall warts, this means connecting the tip terminal of one chassis jack to the ring terminal of the other, and connecting that junction to the main ground point of the power supply. That works fine as long as the two wall warts operate with the same polarity—in other words, the voltages on tip connections go up and down together, rather than in opposite directions. Can you rely on that? These are mass- market items, normally used singly, and there’s no particular reason for a manufacturer to care about polarity. Besides, not every wart comes from the same manufacturer. Because of this uncertainty, I’d rather use the two warts as shown in Fig. 3, connected to separate diode bridges. In this circuit, wart polarity doesn’t matter, and the cost of four extra diodes seems pretty modest for the added peace of mind. You can install Hagerman-style snubbers on the outputs of wall warts, just as you can on the secondaries of conventional transformers, and you can place fuses in the leads from the wall warts’ chassis jacks to the supply, rated at the transformers’ current rating. There’s another way to make wall warts produce ± supplies; I’ll work my way around to that. Next, consider a pair of regulated DC supplies for tube filaments, each 6.3Vdc, 1.2A. Voltage amplifier tubes normally have their filaments referenced to ground, but cathode followers and similar circuits lift their cathodes as high as + This can cause problems; every tube type has a maximum heater- to-cathode voltage rating, typically 90V, and the tube can misbehave seriously if that rating is exceeded. The solution is to hoist the filament supply’s reference up 6 above ground, usually by hanging a voltage divider on the plate supply. With wall warts, this is easy, as shown in Fig. 4. Here the first wart drives the filaments of voltage amplifier tubes; its supply has its common terminal grounded. The second wart drives the filaments of cathode-follower tubes; its common terminal is connected to a voltage divider, similar to that found in my Gamp supply. Note that while this illustration shows a negative common, the method works just as well with a circuit having a positive common. Above: Fig. 4: Two filament supplies for tubed circuits; the first is referenced to ground, the second to a voltage divider from the plate supply, scaled to hoist the filament about 80V above ground. OK, which wall warts? Again without going through the math, I use a 12 transformer to generate 6.3Vdc regulated. Jameco lists several 12Vac devices; I’d go for cat. # 167151, rated at 1500mA. A pair of these will cost $15.18. Time to get fancy with a + 30mA phantom power supply, used to supply juice to condenser microphones. Immediately you’re faced with a problem: This requires about 4 from the power transformer, and I haven’t found any such wall warts on the market. What to do? One solution is a voltage doubler, which would work with a 24Vac wart, but I’ve already said I don’t like those. Besides, this raises a practical question. I have a strong prejudice in favor of making equipment idiot-proof. This is because I sometimes work in situations where I’m sleep-deprived, and my higher cerebral functions become—shall we say—dulled (I’ve called this “chimp n in previous articles). In a wall wart context, this translates into a design limitation: If a device is powered by multiple wall warts, it should be impossible to plug the wrong wart into the wrong jack. Insurance against Murphy’s Law, if you will. One way to do this is to make the jacks different—use 2.5 x 5.5mm jacks for one or two warts, and a 2.1 x 5.5mm jack for another. That certainly works, but it requires a bit of thinking, and also opens the possibility of an operator in chimp mode (me) trying to shove the wrong plug in the wrong hole and bollixing up the whole works. A more elegant solution is to design so that all the wall warts feeding a box are identical—any wart can plug into any jack without problems. How do you do that? Say you wanted to add the +48VDC phantom supply to the two tube filament supplies described in the previous section. They use 12Vac warts, so you’ll need to use the same for the phantom supply. To turn 12Vac into the 45Vac needed for the phantom supply, use an additional transformer located inside the audio chassis, connected to the external wall wart. Is this kosher? Yes— UL cares about what’s plugged into the wall, not what’s on the other end of the cord. I said before you’d need 45Vac on the phantom supply; to get that from 12Vac you’ll need a step-up transformer with a ratio of at least 12:45 = 1:3.75. One easy way to do that is to use a standard power transformer, hooking it up “backwards” with the normal secondary connected to the wall wart and the primary connected to the rest of the supply ( Fig. 5). In practice, the next-lowest standard transformer voltage is 2 Allied’s cat. # 227-2025 is rated at 28VCT/1A, and costs $12.53. This has a turns ratio of 117:28, or about 4.18:1. Turned backwards, that will step up the 12 wall wart’s voltage to 50VAC, higher than you need, but it’s easy to drop the excess voltage in the filter section. Leave the center tap unconnected. What about current? 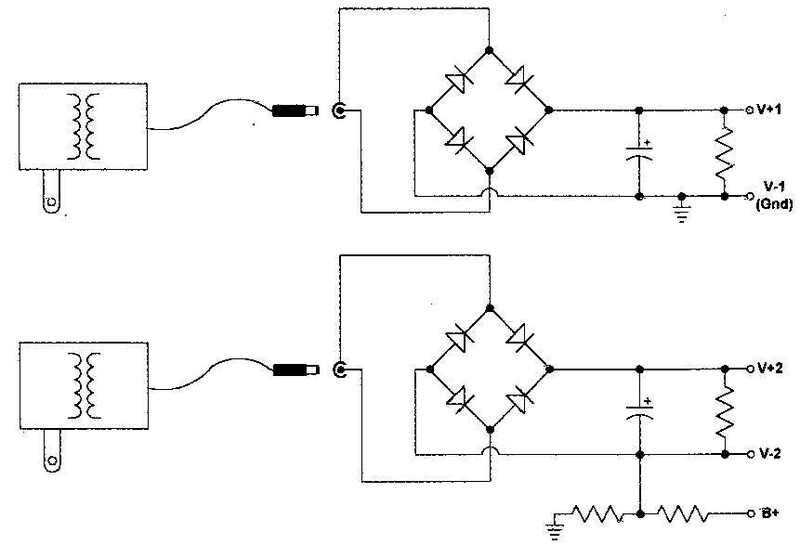 An ideal transformer steps down the current when it steps up the voltage, and vice versa. I specified that the phantom power circuit will draw 30mA; it’s easiest to see what happens to the current requirements by thinking backwards. The 117Vac side of the Allied transformer is pulling 30mA, or .030A; the other side is rated at 28Vac a lower voltage, so the cur rent must be higher by the same ratio, 117:28, or 4.18x. That works out to 4.18 x .030A = .125A. That’s how much cur rent will be passing through the Allied transformer’s 28V winding, and because it’s rated for 1A there’s plenty of margin. Similarly, the wall wart is rated at 1.5A, so it’s nowhere near its limits. Wait a minute, though. This design already has two filament supplies, each drawing 1.2A from warts rated for 1.5A. Would it be possible to piggyback the Allied transformer onto the first filament supply (with common grounded)? Yes; total draw would then be 1.325A, still within the wall wart’s rated capacity. This means you’ll have gotten three sup plies out of only two wall warts. How about adding the phantom sup ply to the balanced-rail ± supply de scribed earlier? That has 18Vac wall warts, so the in-the-box transformer needs to have a ratio of 18:45, or 1:2.5. This suggests a transformer with a secondary voltage of 117/2.5 = 46.8Vac or lower, again connected backwards (the 117Vac primary connects to the diode bridge, the secondary to the wall wart). Flipping through the Allied catalog, I find that none of their house-brand transformers will do the job, but the Triad FP88-65 (Allied cat. # 967-8240) is rated at 44Vac 0.13A with its primaries and secondaries paralleled. The primary is nominally 115VAC, so the turn’s ratio is 2.6:1, just about perfect, and it costs $10.58. It’s a “flatpack” transformer, intended for mounting on a circuit board, but a piece of perfboard will work fine. The internal transformer’s output voltage will be 18 x 2.6 = 47Vac again a bit high but easy to drop in the filter. Current requirement from the internal transformer will be 0.030 x 2.6 = .078A, so it’ll pull very little from the wall wart. It would certainly make sense to piggyback this transformer onto one of the wall warts from the ± supply. Can you use a wall wart to power a tubed circuit? Yes, but for this you’ll need a more drastic step-up transformer. Say you want a plate supply in the +250-300Vdc range that will provide 50mA of current. The easiest way to achieve that is to use a transformer with an “international” primary (dual 120Vac windings). On this type of transformer, the primaries are hooked in parallel for nominal 115-120Vac countries, in series for nominal 230-240Vac. In this case, choose a transformer with a secondary voltage equal to the wall wart’s voltage, and hook it up in reverse. To add a plate supply circuit to the previously described filament/phantom supplies, I’d use another 12Vac wart (to keep Murphy out of the works). Allied cat. # 227-0102 ($15.55) has a secondary rated at 12VAC/2A and a primary rated at 115/230Vac. Will that be enough juice? Look at current first. If I draw 50mA (.05A) from the 230Vac primary, I’ll be pulling 0.5A x 230/12 = 0.96A through the 12Vac secondary. This is about half the transformer’s rated current, a nice conservative margin. It’ll require a wall wart of its own, though; this is too much to be piggybacking. What kind of voltage will this provide? Nominally, the supply should pro duce about 322V_pk or about 320Vdc with a 100uF input cap. With the line voltage 10% below normal, this will drop to about 288Vdc Allowing a few volts to drop in a second filter stage, regulated 270-280Vdc seems reasonable, depending on the dropout voltage of your chosen regulator circuit. When the line voltage goes up to 10% over nominal, expect 353Vpk or about 350Vdc on the first filter stage; I’d use filter and bypass capacitors rated for at least 400Vdc. In earlier sections I described methods for piggybacking multiple circuits onto wall warts to obtain three supplies from two warts. Can you get three from one wart? Above: Fig. 5: Using a second transformer to step up the voltage of a wall wart. As long as the current draw is reasonable, you can. With commercial parts, there’s not enough juice to do filament, plate, and phantom supplies, but (say) ± for opamps and + for phantom is doable. The part that makes it possible is a transformer with dual primaries and single or dual secondaries of identical voltage. The Hammond 185*230 series is a good example, avail able from Allied (substitute letters C, D, E, F, or G for the asterisk to choose current rating). Triad makes similar transformers, either in wire-lead or printed-circuit-mounting packages. Take a look at Fig. 6. The two primaries of the top transformer are connected in parallel; the two secondaries are connected in series. The nominal voltages are 115Vac and 230Vac but in reality this transformer is a general-purpose converter that changes a voltage of X to a voltage of 2X, with a center tap. In the example, the Hammond 185F230 transformer (Allied cat. # 836-1881) is connected to an 18Vac wall wart to produce a 36VCT transformer, perfect for feeding a ±15Vdc regulated supply. Hanging on the same wart is the Triad FP88-65 to provide phantom power, as discussed above. How much current can you draw from this supply? The wall wart is rated at 1A; the phantom circuit will pull 0.078A. This means you can draw an addition al 922mA from the wart. 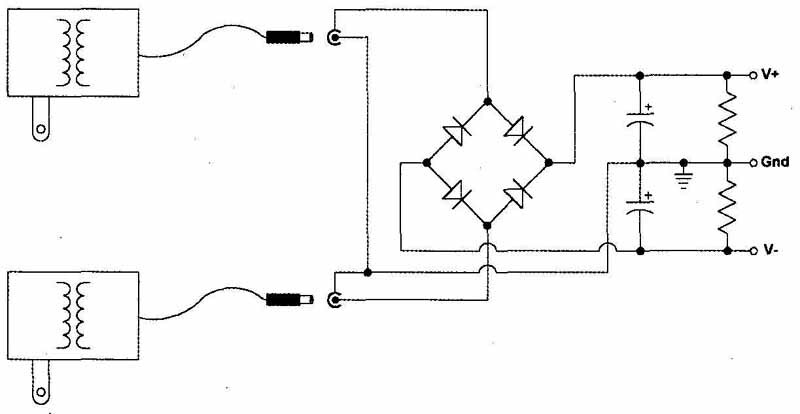 Because the transformer has an effective 1:2 volt age ratio, the current ratio is the inverse of that, or 1:0.5; you can draw 461mA from the Hammond transformer’s secondary. The Hammond transformer is rated at 570mA in series mode, so it will be happy. Three outputs from one wall wart; what’s the catch? Cost—the Hammond transformer runs $25.26, while an additional wall wart plus chassis jack would cost about $12.20. The trade-off is paying about $13 more for the simplicity (and potential Murphy-proofing) of a single wart. (Note that using the hookup described here also puts a higher-current transformer inside the box, which makes it more likely to cause coupling problems to audio circuits.) Electronics is the art of choice and compromise. I hope this article has demonstrated that wall warts don’t deserve the junky reputation they’ve attracted. They’re actually highly useful gadgets, and can help make your projects easy to build and thoroughly legal. Use them in good health! Above: Fig. 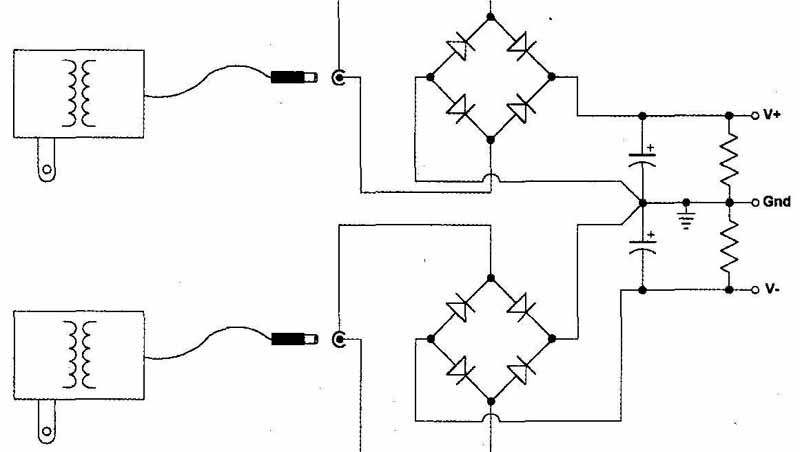 6: Using two additional transformers to derive three DC voltages from a single wall wart. 1. Jim Hagerman, “Calculating Optimum Snubbers,” 1/1 998 Audio Electronics, p.26. 2. Paul J. Stamler, ‘The Gamp: Adaptable Power for Tube Amps,’ 7/2007 audioXpress.